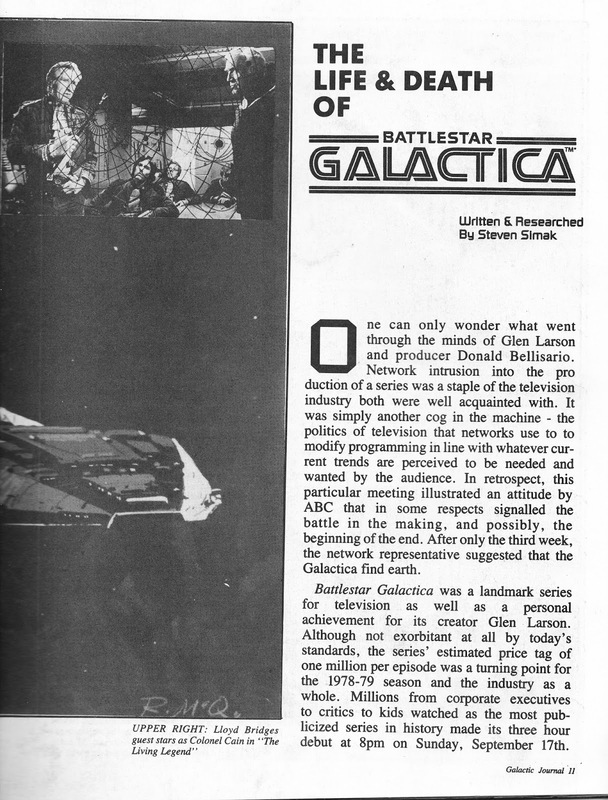 I don't mind telling you, this copy of the first issue of weighty US fanzine (bordering on pro-zine) GALACTIC JOURNAL was one of the most -if not THE most - important fanzines I ever bought. 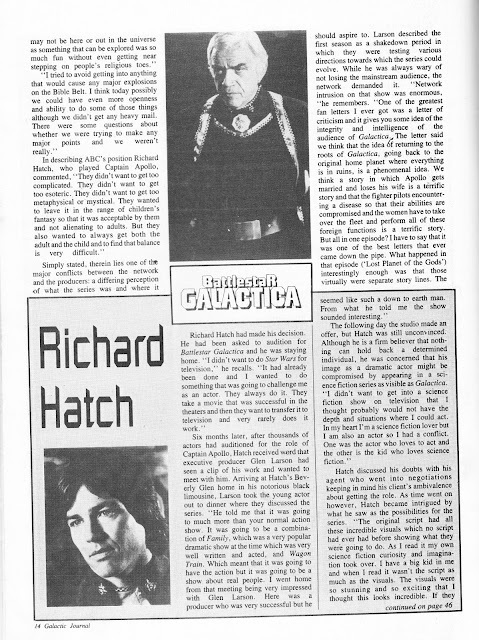 When BBC TWO started rerunning BATTLESTAR GALACTICA around this time (its first outing since ITV first aired the show in the early 1980s... and its first networked slot in the UK) I was fairly scornful at first... but I also made sure that i never missed an episode in its Wednesday at 6 slot. By the time the run had reached War of the Gods (skipping Saga of a Star World, The Living Legend and Fire in Space along the way) I was hooked. 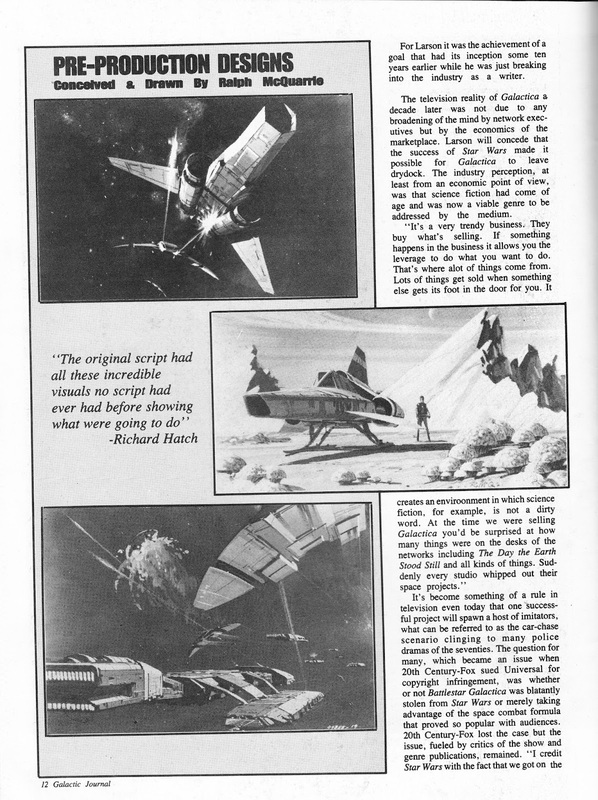 But - pre-internet - there were very few sources of hard-and-fast information out there. I wasn't even sure how many seasons (note: I'd automatically assumed it had run for at least a few years. 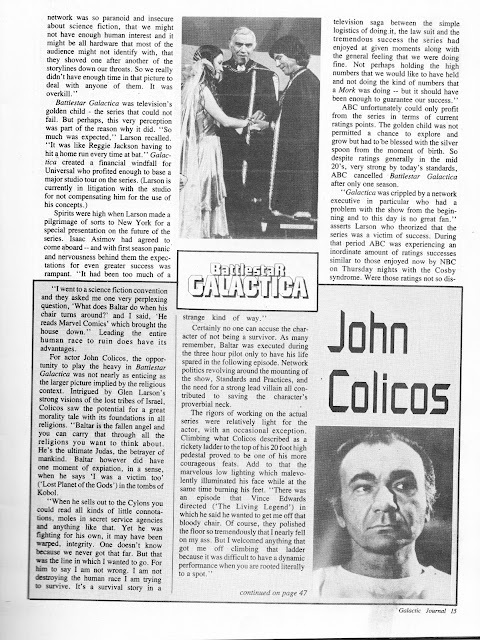 Oops) it had originally aired. 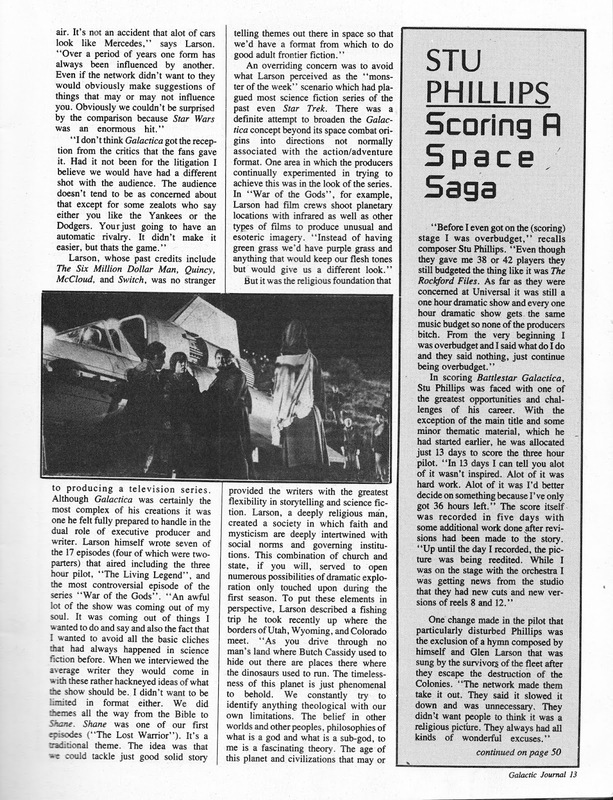 I did sign-up to join Britain's THE THIRTEENTH TRIBE (see here for a partial newsletter cover gallery) but - and I think this was a fundamental flaw with the club - it didn't produce a "Bluffer's Guide" type fact sheet for new members. They just assumed you knew... and I didn't. 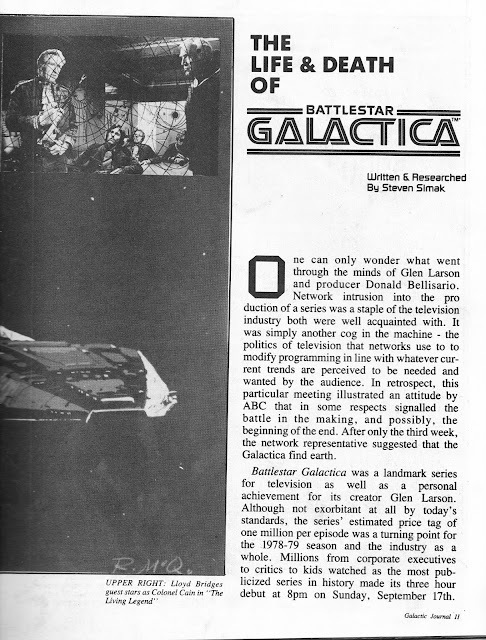 So - imagine that woohoo moment when I found a copy of this fanzine on a dealers table at the old Westminster Comic Mart at Westminster Methodist Hall. 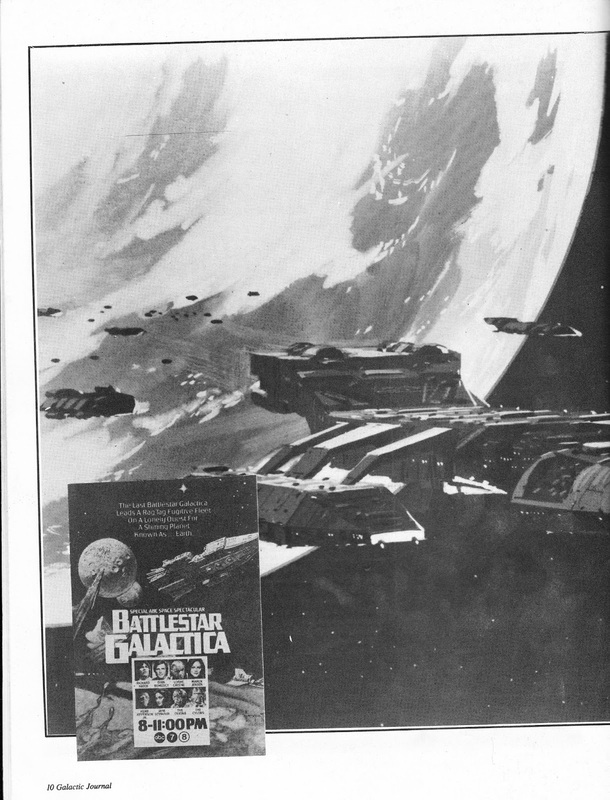 I can't remember how much I paid for it (budgets were tight in those days) but I devoured the lengthy Battlestar piece... and never regretted the purchase. 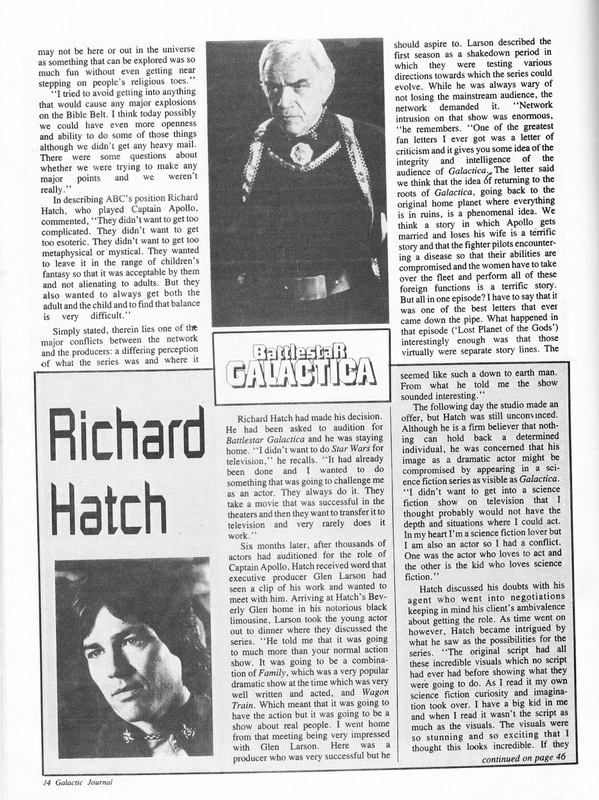 The author, Steven Simak, revisited the Galactica universe for several similar articles which appeared over the next decade-or-so. The lengthy pieces, which appeared in NOT ON THIS EARTH and SCI-FI UNIVERSE (I think), went over some of the same ground but were significantly different enough t not feel like a straight rehash. Steven: let me take this moment to salute you for writing about the show I grew to love when no-one else was. Thanks. The article is a long one so I've decided to post it over two parts. 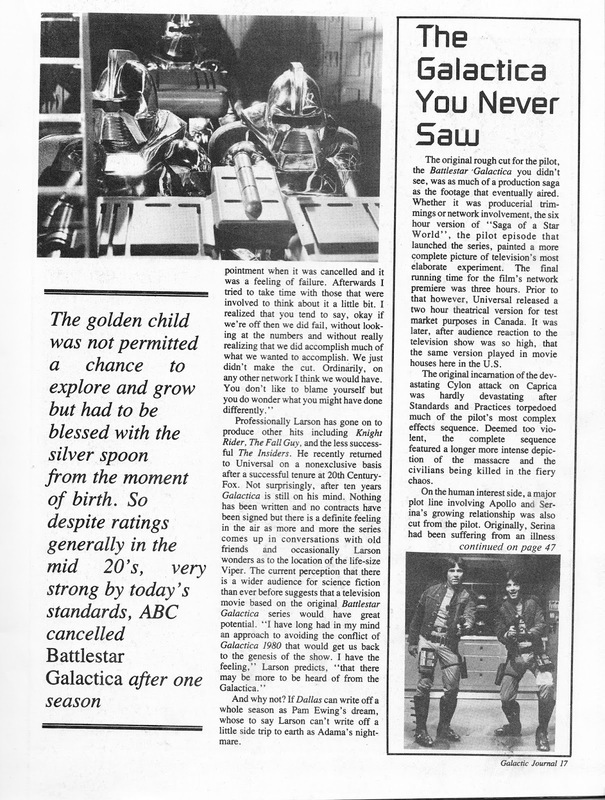 The rest of the issue is devoted to an equally lengthy overview of the first episodes of STAR TREK: THE NEXT GENERATION's inaugural season. 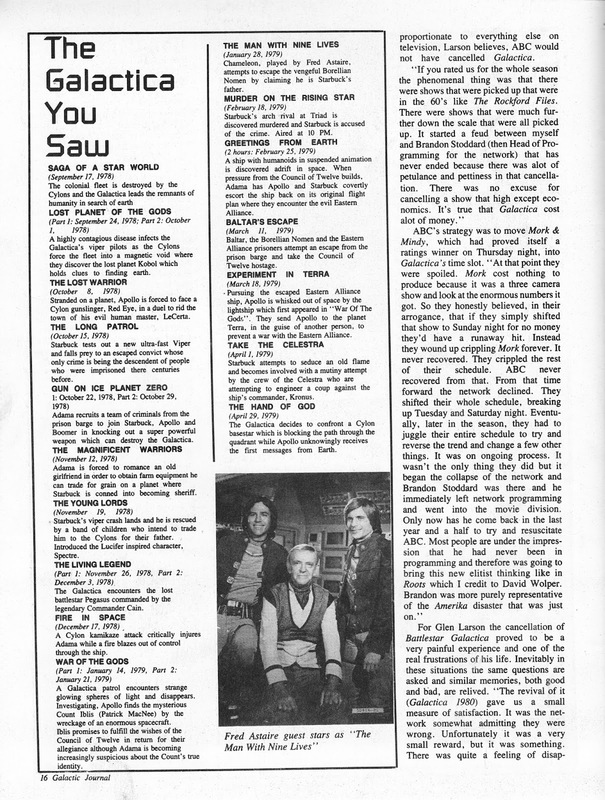 It hadn't reached British TV at this point (although, I may have seen the rental release of Encounter at Farpoint) so any writing on the show was welcome but - thanks to the official Starlog magazine (later reprinted in Marvel UK's indifferent STAR TREK: THE NEXT GENERATION comic) - it was already starting to feel familiar. 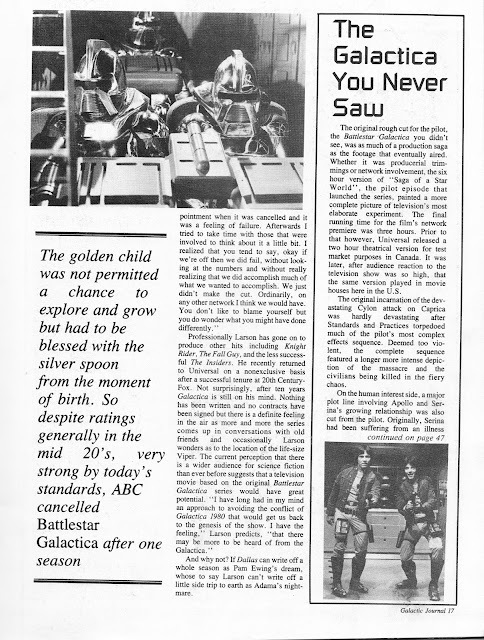 I have no idea what happened to GALACTIC JOURNAL. I've never seen another copy of this issue... or any subsequent issues again.